As a chef I am really privileged to be able to work with high quality local produce that’s on my doorstep, or at the most a phone call away. Anything from organic venison to full fat Guernsey dairy. Gay’s Dairy is a local gem that recently gave birth to ‘The Meat Room’ where I buy my local, whey fed pork. 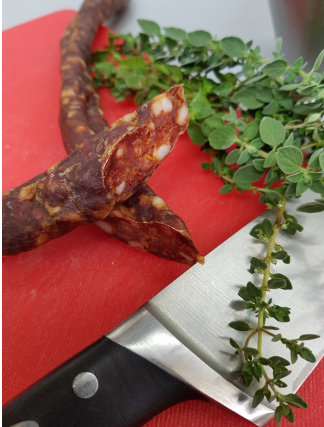 This beautiful local product inspired us to experiment with a few ideas and furthermore led to our own range of charcuterie products. The team had the pleasure of watching a master class with Neil Jewell earlier this year so we felt confident. We kept it simple and made some chorizo sausage, salami and pancetta and in addition we will cold smoke some of the pancetta to make bacon. First of all we process the meat and grind it ourselves, everything from scratch. 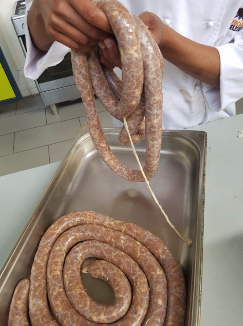 In addition we temper our own spices and with the help of a bit of curing salts, hog casings and a sausage making machine, we have a final product. 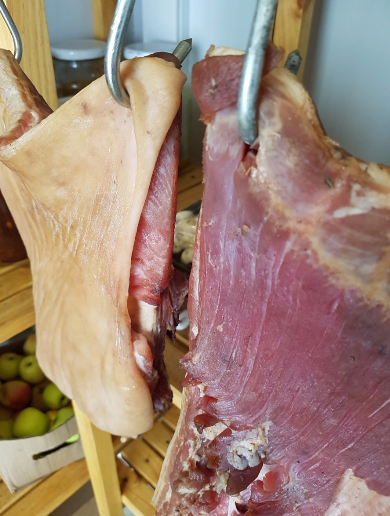 The pancetta is very easy to make and can be done at any home that has a fridge and a cool, ventilated area to hang the meat. Get yourself a good quality, fat pork belly and follow the few easy steps. This is a combination of possible spices that can be used: Rosemary, thyme, garlic, pepper, fennel, nutmeg, cloves, honey, cinnamon. 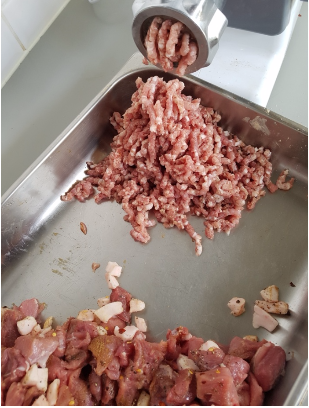 Make sure your ratio of pink salt to meat weight is correct. 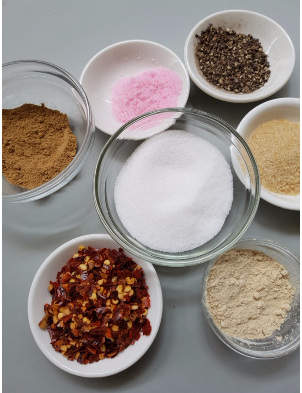 Pink salt or quick cure can be obtained at any spice supplier or most butchers. Rub the meat the salt, sugar, quick cure and chosen spices. Place in zip lock bag in the fridge and turn everyday for one week. There will be some liquid brine in the bag. After 1 week, remove from the bag and rinse. Hang in a cool ventilated area for 3 to 4 weeks until the pancetta is dry and firm. See you in our kitchen for a cooking class this summer. Wishes and good health for a festive season – chef Jaco.